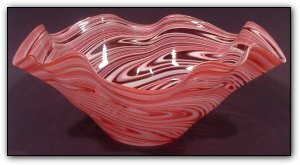 This hand blown glass fluted bowl is made from hand blown cane that is deep pink, white, and clear. The bowl is pinker than it shows on most computers. and does not have any black in it. Please note that there is now black in the bowl and you are seeing the black through the clear areas of the bowl.